Sydney Clouts was born in Cape Town in 1926 to a South African mother and Scottish father. He began his studies at the University of Cape Town initially reading for a law degree. He changed focus during the course of the degree and finally completed an MA in Literature at Rhodes University. He later obtained a qualification as a librarian and worked as such in London after emigrating to the United Kingdom in 1961, where he lived for the remaining twenty years of his life. He returned to South Africa only for the period from 1969-1971 to complete his dissertation on Thomas Pringle, Francis Carey Slater and Roy Campbell. His life in the United Kingdom did not mitigate the pain he felt in exile in Europe and he viewed Europe as a “museum of dead cultures” longing for a new tradition to emerge from his land of birth. 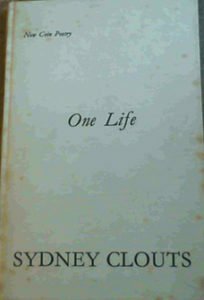 In 1966, he completed his debut poetry collection, One Life for which he was awarded the Ingrid Jonker Prize in 1968 together with the Olive Schreiner Prize for English Literature. It was the only volume of poetry to appear in his lifetime. Arranged in three sections, the poems are characterised by striking imagery and an austere style. His concerns are starkly elemental: stones, flowers, trees and rivers recur in his work and are carefully weighed for symbolic value. In the smallest of images, he saw the universe reflected. In 1982, he died prematurely at the age of 56 from cancer. 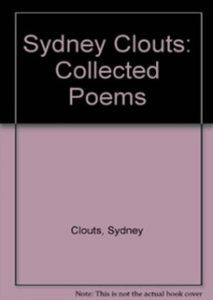 A collection of his poetry was published posthumously in 1984 edited by his wife Marjorie and brother Cyril Clouts, titled, Sydney Clouts: Collected Poems. However, a large selection of poems published in New Coin, were not included in the Collected Poems anthology and a debate followed relating to whether the Collected Poems comprised a complete selection of the poet’s work. 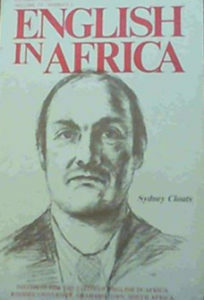 In 1984, English in Africa, produced a memorial issue dedicated to the work of Sydney Clouts. Clout’s poetry remained little understood for much of his life. Little or no critical review of the poems was available and the poetry remained inaccessible to most. His complex poetry invokes a sense of mystification yet engenders respect within the established South African critical consciousness. His work received prominent display in Michael Chapman’s South African English Poetry: A Modern Perspective. The notion that the work is difficult to understand requiring a reading embracing post-structuralism, is one of the reasons that many did not fully understand his poetry. 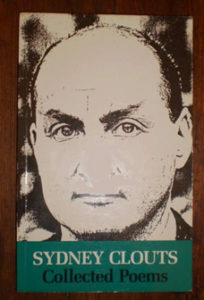 Ruth Harnett in her journal article of 1984 titled, Some Poems of Sydney Clouts, writes that Clout’s poems are written by a poet with extrinsic versatility and range. His poetry was influenced by ninetieth and twentieth century American poets, as well as metaphysical poets such as Keats, Yeats, Wordsworth and the South African poets Campbell, Butler and van Wyk Louw, as well as poets read in translation such as Neruda and Dante. The notion of poetic tradition and the nature of poetry itself, occupies an important position in Sydney Clout’s work. Other recurring themes include: i) the notion of darkness and a journey into darkness. This darkness relates to the spiritual, psychological and existential and his work is often viewed as being modernist for this reason; ii) the journey of the mind; iii) several poems harness the voyage of discovery and the Portuguese exploration of Africa – Prince Henry the Navigator (a symbol of the mental traveller) and Bartholomew Dias (c. 1450 – 1500) are two personalities that occur in his poetry as character studies. His poems on these explorers are an attempt to inhabit the consciousness of the early explorers of Africa and probe the mystery that drove them on; and iv) the notion of human consciousness and the contrasting unselfconsciousness of nature – the ultimate aloneness of humanity and the inexorable approach of a coming death is a theme that is present in many of his poems. Butler writes that his humble function was to bring attention to the ancient, unchanging spiral of life. He explains that Clout’s interest in politics was intelligent and anguished but that it was not his main concern – that Clouts was preparing for a more profound revolution than any politician could offer. Clouts believed that the poet’s function was not to propagate answers or support formulae already provided by religions or political philosophies, but to, “ ask questions, to listen for what has not been heard before, to extend the antennae of intuition, and, through his use of language, to make possible ‘an increase of consciousness’, not merely for himself, but for an entire culture.” (Butler, 1984). Harnett confirms that seeing Clout’s poems on the page is often important. He juxtaposes and separates parts – words, phrases, lines and sections – as a way of organising his thoughts. It is said that he often agonised over the placement of a single comma. Everything mattered. Clout’s work is rooted in Africa. Joubert points out the irony that as Clouts was unable to live out his life in Africa, living in exile in the United Kingdom, he effectively severed himself from his poetical source. This is one of the reasons that Joubert argues for his lack of production of work in his later years. Butler, G. 1984. On Sydney Clouts. English in Africa Volume 11, Issue No 2, p.81-108. Harnett, R. (1984). Some Poems by Sydney Clouts. English in Africa. (Vol. 11. No 2) (pg 108 – 161). Cornwell, G Klopper, D, MacKenzie, C (eds). The Columbia Guide to South African Literature in English Since 1945. Columbia University Press.